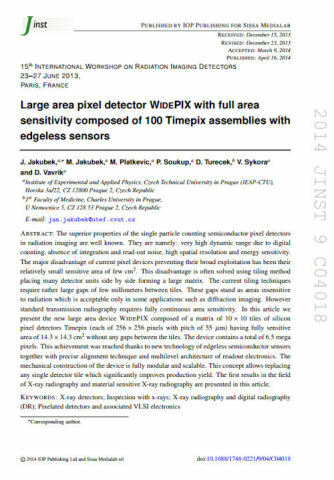 The leading detector technology used in the X-ray imaging solutions presented here is based on Medipix hybrid pixel detectors. These devices were developed within international collaboration of universities and research laboratories lead by team at CERN. The major difference of these devices compared to standard charge integrating imagers (CCDs, flat-panels) is the signal processing electronics integrated in each individual pixel. Sensors are pixelated arrays of reversely biased diodes. The impinging radiation generates charge, which is collected to appropriate pixels, amplified and compared with pre-set discrimination level. Then, depending on pixel settings, either the counter is increased, or the pulse height is measured or the time-of-arrival of the radiation is recorded. There is no dark current measured in pixel thanks to the per-pixel processing electronics and discrimination threshold. Therefore, the noise in pixels corresponds only to the photon counting noise. All other sources of noise in pixels are eliminated. Another advantage of Medipix/Timepix detectors is the speed of readout that allows frame rates up to 1000 frames per second.